It's time again! Each month, as part of the Secret Recipe Club, we're (secretly) assigned another blogger, and we get to pick a recipe of theirs to make. This month, I got Renee's Kitchen Adventures. She's certainly got lots of yumminess going on, and I had some difficulty selecting a recipe! Did I want Chicken and Dumplings, Mozzarella Stuffed Meatballs, or Hummingbird Cupcakes? Well, it turns out, I decided to try Two-Ingredient Pancakes. 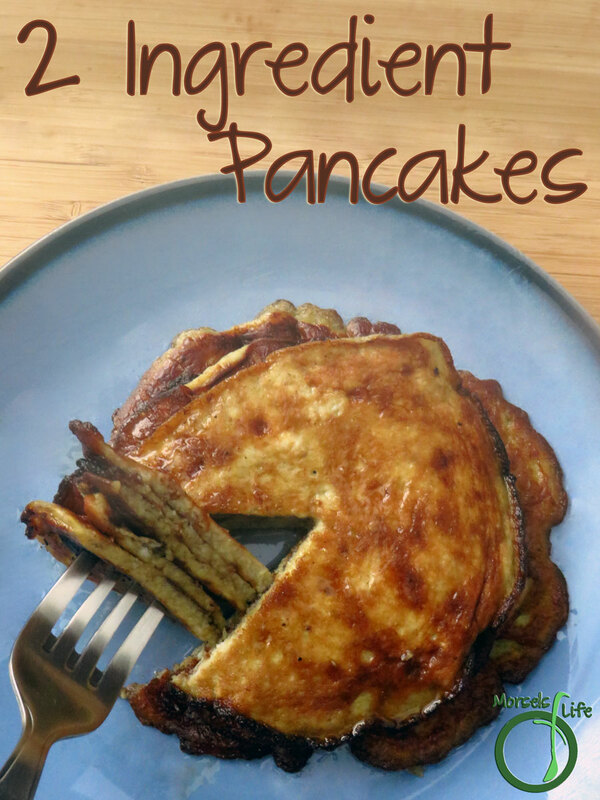 I'd heard about these pancakes before, especially as I was researching Paleo. 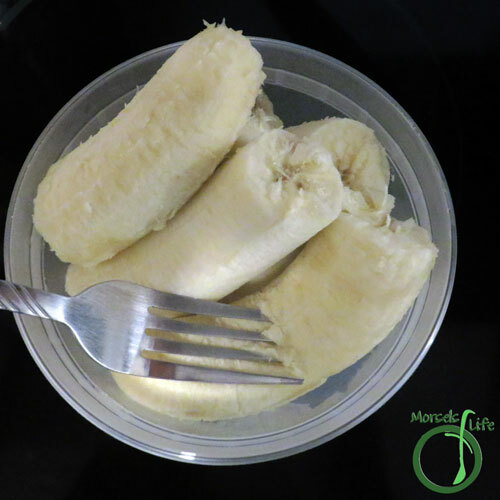 However, I never gave them a try since I wasn't sure how they'd turn out, and I'm not really a huge fan of banana. (Plus, I keep some DIY Bisquick around in case I need a quick pancake fix!) I modified the recipe slightly since I wanted to use regular eggs instead of eggbeaters. What are some of your favorite two or three ingredient recipes? 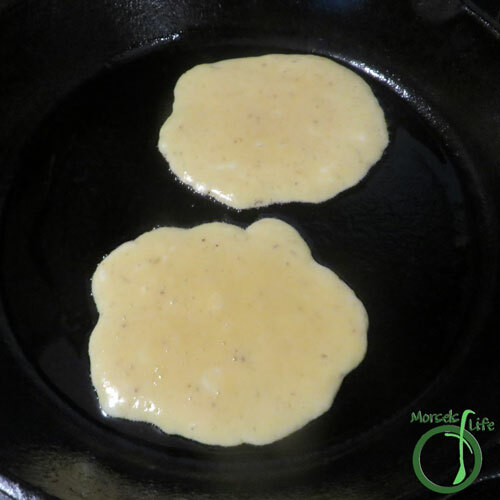 Try the simplest pancake recipe ever - just two (or three) ingredients and minutes from bowl to table! 3. Beat eggs, and then beat in mashed bananas. 4. Cook about a quarter cup of batter on a greased pan. I'd recommend going with a smaller than usual amount of batter since these pancakes are a bit more difficult to flip, and a smaller pancake's just a bit easier to work with. So glad you enjoyed them. Yep, not a traditional tasting pancake in any way, but still pretty delicious! I count three ingredients, but still. Amazing. Thanks for sharing, CJ. It's almost like a thick crepe. :) I'm wondering if it'd make a nice wrapper for a sweet crepe now! So good to know. I've been wanting to try these too. Now I will. Hi there CJ! I found you on Janice's Mostly Blogging Linky Party! Thank you so much for hosting! This recipe sounds amazing! Even I can do this! Not the best cook in the world, but I'm trying to learn. :-) Hope you are having the most wonderful week CJ! Welcome! Hope you enjoy this recipe. :) It's only got two (or three) ingredients, so it's a great place to begin. Let me know what you think if you try it out. Hope you are having a great week! I've always wondered about these pancakes. Weird that they don't taste more like banana! Fun choice for SRC! Thank you so much for responding CJ! And I will definitely let you know how they turn out:-) Thanks again! Well, I'm excited about these pancakes, all right. Going to try them this weekend! 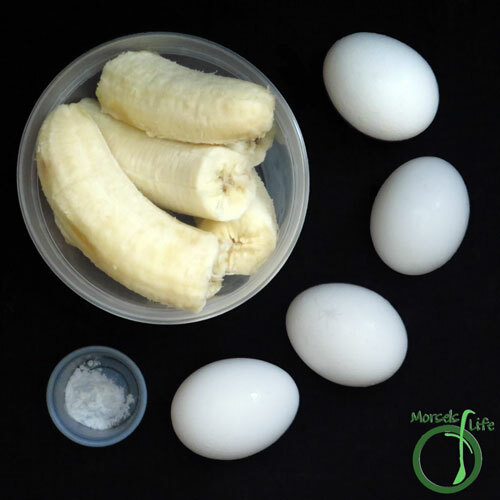 We love eggs and bananas, and I can imagine how they are going to taste. I'm assuming there's no baking powder, since this is a 2-ingredient recipe, but just in case, I thought I should ask. 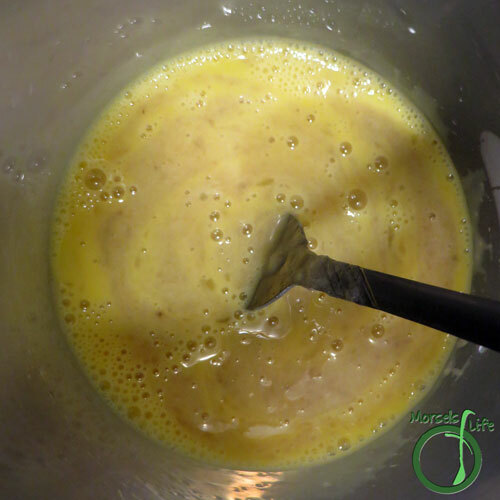 If we DO need it in the batter, when do we add it? Just before we pour the batter onto the griddle perhaps? We liked these pancakes. They definitely don't taste like your usual pancakes, and surprisingly didn't taste like bananas either. Thanks for pointing out the missing baking powder! I did use it in Step 3 to help make the pancakes fluffier. However, I have heard of many people skipping it, and the pancakes turned out fine too. :) I have this recipe titled as Two-Ingredient Pancakes since the baking powder is optional. Maybe you could try it both ways and see which you prefer. :) Let me know what you think once you've tried them! 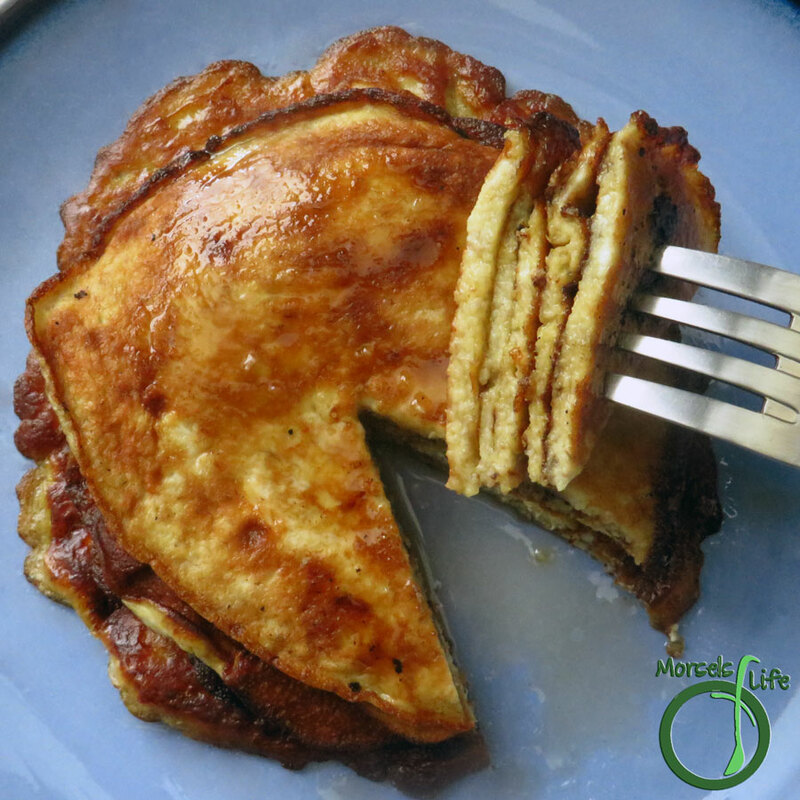 These pancakes sound so simple to make, healthy, and tasty. Thanks for sharing on Real Food Fridays. Pinned & tweeted! Once day I have to remember to set aside bananas for making these pancakes. They look so easy, and I've heard they're delicious. Great choice for SRC! Isn't it odd how it's those recipes that require the fewest ingredients that it takes the longest to get them? 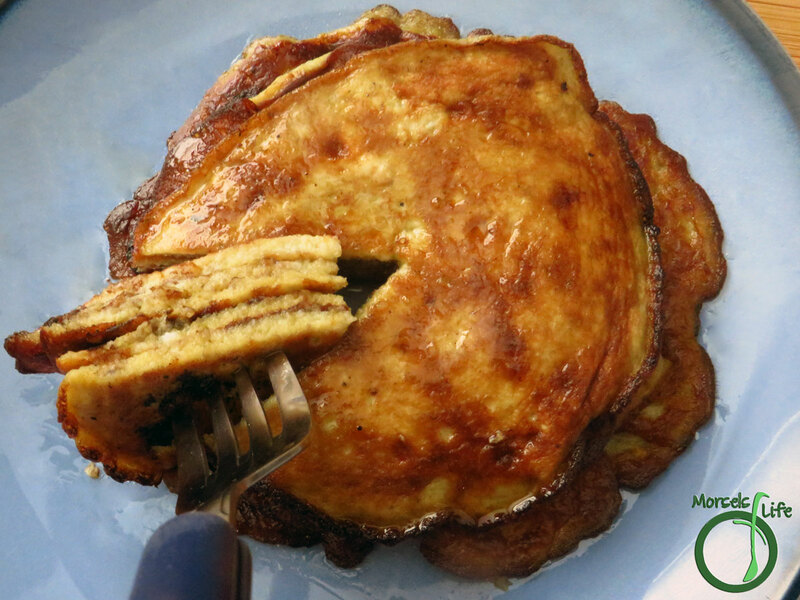 I know I had to set aside bananas a few times before I could finally make these 2 ingredient pancakes. :) They are really easy to make and yummy too! Yes - they definitely are! Just two (or three) ingredients and less than 15 minutes from bowl to table. :) Hope you enjoy! The next time I buy bananas I'm buying a few extra so I can try this. Great SRC choice. Oh yes! These are amazing pancakes!! And yet so simple! Thanks for sharing this recipe! I know I'm going to have try them ASAP! These look delicious and so easy to make! Looks yummy! Thanks for sharing on the Healthy Living Link Party. I love pancakes, these look delicious. Hope you are having a great day and thanks so much for sharing with Full Plate Thursday.